It’s cold. The days get darker, earlier. The kids are off from school and daycare and you’re about to go stir crazy! Oh wait, maybe that’s just me. If you’re in the same boat, let’s talk about indoor play. There are so many places around the DMV area that offer indoor options for kids of all ages, sizes and interests. The list below are some of my favorites within a 25 minute drive (or so) from Tysons. Make sure you check their individual websites for hours (some require reservations), height or age restrictions and costs. Many offer coffee or snacks and free wifi if you want to squeeze in some work, others offer drop-off play hours and some require a caregiver to stay at all times. Nook (Mosaic District) — Ages 0-5, brand new, basic play without over stimulants. My kids loved the ball pit (my 4-year old jumped into it with reckless abandon a good dozen times). Cost is $20 a day per child (free parent admission) while siblings under 3m are free. One Upon A Dream (Vienna) — An open play space with various themed areas, free wifi, snack bar and drop-off options as well as camp options. $10 per child & $10 per adult, $5 second parent while under 9m is free. Price is for 2.5 hours of play. Mobu Kids (Falls Church) — Recently reopened, brand new play space for the under 5 crew. Soft play surfaces, open play and drop-off options. $13 per day. Diamond Heroes Batting Cages (Mosaic) — You can “rent” a batting cage lane online in 30-minute increments. Will require someone to feed a ball into the machine but it’s a great option for your baseball enthusiast who is itching for spring! $40 per half hour or $60 for 1 hour. Oak Marr Rec Center (Oakton) — Indoor pool open swim (check calendar availability). Spring Hill Rec Center (McLean) — Indoor pool with open swim option. Flight (Springfield) — Trampoline park with open jump hours, including toddler jump. Pro tip, reserve online ahead of time and sign the waiver to avoid waiting in a long line. Town of Vienna Community Center (Vienna) — Indoor basketball courts free for use. You can bring a ball of your own or borrow one. Check the schedule. Cub Run Leisure Pool (Chantilly) — Indoor pool with small play structure, slides, big water slides, whirlpool and a hot tub. Pro tip, make sure you call ahead and verify the pool is open. We got there one day to find out the pool was closed that day for an “accident”. 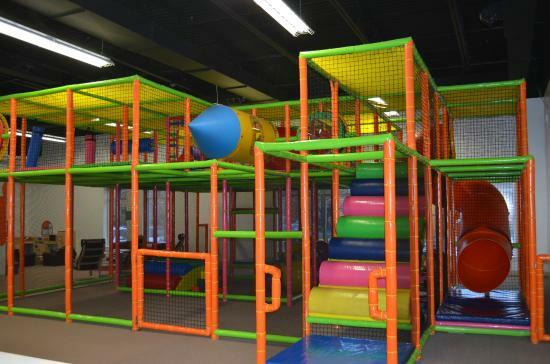 Chibis Indoor Playground (Ashburn) — Great for the under 4 crowd, huge play structure to climb, bounce house, cars to ride, kitchen, trains, etc. They have a snack and coffee bar. $8-10 per child depending on mobility. Kid Junction (Chantilly) — Another great play space for the under 5 crew with indoor slides, toddler area, arcade and a cafe. $8 for kids under 2 and $11 for kids 2-9. Zava Zone (Sterling) — Indoor area better for the older crowd (5+) that includes high ropes course, trampolines, zip line, low ropes course, pole walk and more. $20 for 1 hour, $34 for 2 hours, etc. Pro tip, reserve your space online and sign the waiver online as well. Also, don’t forget about old favorites like Chuck E. Cheese in Fairfax, Dave & Busters in Springfield or bowling (there’s one in Falls Church or Fairfax). You can sign up at Bowl America for their Kids Blast Pass which lets kids bowl up to 2 games per day for free (online this says summer only, but you may want to call them for info).